A short biography of Nikolai, the far less known brother of the anarchist Anatoli Zheleznyakov. In August 1895 the Zhelezniakov family, from a peasant background, moved to Moscow, where the father Grigori finally got a job as a superintendent of a large administrative building. He and his wife Maria had four sons and a daughter. The first, Nikolai, was born in 1893 and the youngest, Viktor, in 1899. By the age of fifteen Nikolai had absorbed radical and progressive ideas., like many other young Russians of the period. Both he and his younger brother Anatoli read many books and newspapers and were familiar with anarchist, socialist, liberal, and Marxist ideas and often discussed the problems of the world. They had an international outlook and were aware of the plight of black people and native Americans in the USA, and of all those peoples under the yoke of the colonialist powers. This outlook impelled Nikolai to attempt to run away to sea. He went to Odessa , but his attempt to get on a ship failed. He was detained by the authorities and returned to his worried parents. His father died suddenly of a heart attack in 1902 and Nikolai, at the age of 18, again went to the Black Sea, where he got work on a merchant ship. He became an anarchist communist, like his younger brother. 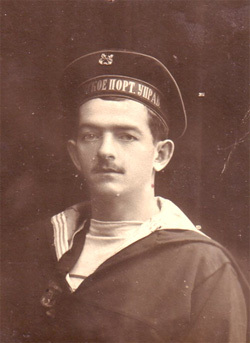 He later served in the Navy and was a seaman with the 2nd Baltic fleet at Kronstadt. In 1917 he was a leading light in the Kronstadt organisation of anarchists. He took part in the October uprising in Petrograd. By the end of 1917 he had developed a wholly negative attitude to working with the Bolsheviks, unlike Anatoli, who believed that it was necessary. Nikolai’s influence began to grow over that of his brother among the Kronstadt sailors, who were beginning to share his attitude. He had influence on the battleship Republic and in the Krukovka barracks. Using an accident where Nikolai and his comrades had arrested three officers they believed were counter-revolutionaries, the Petrograd authorities announced actions against the anarchist naval crews and tried to disarm and arrest them. Nikolai escaped from Petrograd and went to the Ukraine with a group of anarchist sailors, apparently commandeering a passenger train to get there. There he led a large band that fought the Hetman Skoropadsky and his Austrian and German backers. He was killed in action in 1918 or 1919. Has anyone totted up all the biographies of revolutionaries that Battlescarred has contributed to Libcom? I've must endeavour to read them all — but there must be well over a hundred. TBH I haven't, and I would think he hasn't either. Also I think there are probably a fair few published collectively in things like Organise which he would have mostly written as well. It would be good to do a book of them one day! I thought I may have been underestimating a little. I'm going to start going through them. And as Steven wrote, it would be great to have the biographies published as a collection.